Thanks for the Memory to Luciane Via Ace of Spades HQ. NEW YORK - At the behest of CBS, an adviser to John Kerry said he talked to a central figure in the controversy over President Bush's National Guard service shortly before disputed documents were released. Joe Lockhart denied any connection between the presidential campaign and the papers. (Uh huh. The way things have been going in this case, buddy, you might understand if we view this claim... skeptically. )Lockhart, the second Kerry ally to confirm contact with retired Texas National Guard officer Bill Burkett, said he made the call at the suggestion of CBS producer Mary Mapes. It's a good thing the media is so unbiased, or we might think Mapes was trying to help Kerry. "He had some advice on how to deal with the Vietnam issue and the Swift boat" allegations, Lockhart said Monday, referring to GOP-fueled accusations that Kerry exaggerated his Vietnam War record. "He said these guys play tough and we have to put the Vietnam experience into context and have Kerry talk about it more." You're sure he didn't saying anything about "fighting fire with fire, even if you have to start the fire yourself? Lockhart said he thanked Burkett for his advice after a three to four minute call. Lockhart said he does not recall talking to Burkett about Bush's Guard records. "It's baseless to say the Kerry campaign had anything to do with this," he said. Then why are we talking to you? The fact that you called him, on CBS' advice, right in the middle of the whole mess, you don't consider that a bit... suspicious? CBS News apologized Monday for a "mistake in judgment" in its story questioning Bush's Guard service, claiming it was misled by the source of documents that several experts have dismissed as fakes. Burkett admitted this weekend to CBS that he lied about obtaining the documents from another former National Guard member, the network said. CBS hasn't been able to conclusively tell how he got them, or even whether they're fakes or not. Kerry ally Max Cleland, a former Georgia senator, also said he had a brief conversation last month with Burkett, who told him he had information about Bush to counter charges against Kerry's Vietnam War service. Cleland said he gave Burkett's name and phone number to the campaign's research department. But... but... I thought it was "...baseless to say the Kerry campaign had anything to do with this"! What is this your telling us? Kerry spokesman David Ginsberg said nobody in the campaign's research department followed up on Burkett's offer of information. Again, we're a bit skeptical, given how many times we've been lied to in this whole mess. Lockhart said Mapes asked him the weekend before the story broke to call Burkett. "She basically said there's a guy who is being helpful on the story who wants to talk to you," Lockhart said, adding that it was common knowledge that CBS was working on a story raising questions about Bush's Guard service. Mapes told him there were some records "that might move the story forward. She didn't tell me what they said." That's the part of this story that galls me to no end. Forget the direct link to a Kerry campaign worker. It's possible, but not likely, that he acted independently, and that they really ARE telling the truth (for once) when they claim a lack of collusion. But the fact that Mapes, the CBS Producer of the story, called a member of the campaign staff of one of the two candidates, with information she thought would help him defeat the other candidate, nails the lid in the coffin of any claims to impartiality on the part of CBS. This nails the lid in the coffin of any claims to impartiality on the part of CBS. Thanks for the Memory to reader Mark at Ace. Apparently, even Mapes' own FATHER recognizes her as a DNC Shill. Thanks for the Memory to Random Birkel via Ace of Spades. Apparently Joe Lockhart isn't the only member Kerry camp talking about contact with Burkett. In an interview on MSNBC's Hardball (the most poorly named program on TV), Tony Coelho claims that the DNC saw the Burkett documents, but suspected they were fakes. Which raises a couple of questions in my mind: If you knew they were fakes, why didn't you say so when this story first broke? Hoping that little tidbit wouldn't come out? Hmmmm? And if you knew Burnett was passing fake documents, why didn't you warn Kerry's staff not to take his advice on ANYTHING?????!!!!! In trying to exhonorate themselves, the DNC just sinks deeper into this. A little bit of advice: When you're up to your neck in quicksand, STOP STRUGGLING! Again via Ace of Spades. This Article from USA Today is the most damning yet. It implies that Burkett agreed to give CBS the documents only on condition that they arrange a meeting between him and the Kerry camp! Dan Rather should quit now. Hey, at least he'll have a job as a press aid to Kerry. Thanks for the Memory to Little Green Footballs via Ace of Spades HQ. 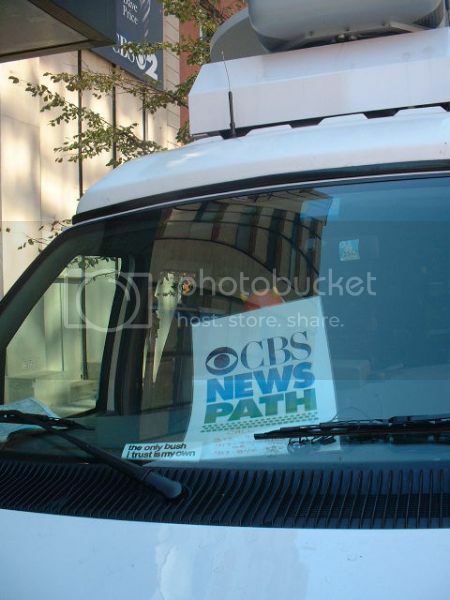 The small sign under the CBS News sign reads, "The only bush I trust is my own." Ha ha ha. How clever. Oh, THAT Liberal Media Bias. Albany, OR – Apparently, some people can’t take a joke. Last month, the Oregon College Republicans began a campaign of sorts against Democratic Congressman Peter DeFazio. Upset over DeFazio’s lack of willingness to debate his opponent, Republican challenger Jim Feldkamp, the CRs began using a chicken suit to try and goad the reluctant Democrat into accepting more debates. To date, the only debates accepted by DeFazio are scheduled for October 20 – five days after ballots are dropped. Thursday, DeFazio made some appearances in Albany. One of the first was a radio interview at KGAL’s downtown studio. Unfortunately for DeFazio, The Chicken decided to stop in and watch the interview as it was in progress. The Chicken even had signs with questions written on them that DeFazio had previously refused to answer. Once the interview was over, DeFazio and his staffers literally manhandled the chicken, threatening him and his family, and displaying the type of conduct not normally expected of statesmen and Congressional staffers. The Chicken has subsequently reported receiving several prank phone calls at his house. He has been severely traumatized by the whole experience, and is currently seeking therapy as a result. The incident occurred at an ountdoor event held by KGAL NewsTalk Radio 1580 AM in Albany, outside their studios. The interview is with KGAL host Jim Willhight, and is set to air today at 1:00 PM PDT. The public was welcome, and encouraged to come and ask questions of the congressman. So the CR's sent the Chicken and a few other members to the event. Matt said that DeFazio exited the event looking upset, so I'm looking forward to hearing it. While they were entering the area where the interview was being held, and again when the left, the CR's were confronted by an individual who seemed quite displeased with his presence, and wanted to know what questions they had to ask (Matt's words were that this individual "got in the face" of one of the CR's). This individual then informed the CR that he would find out who he was, who his family was, and where he lived. He then left with DeFazio, leading the CR's to believe he was a DeFazio staffer. The CR in question has since received several "prank" calls, all of which have been recorded. According to Matt, no mention of this incident has been made by KGAL or any of the local and state news sources they've sent it to. I doubt it will. Unfortunately, unless they got it on tape or video, it's the CR's word against DeFazio's. But while I'm hesitant to make a "post hoc" leap regarding any connection between the incident and the prank calls (at least not unless I have a chance to hear them), I wouldn't be surprised if there is a link. I just ran across this essay at In Extremis. I highly recommend it.